Want to own a piece of music history, not to mention one of the coolest and best-sounding mixing consoles on the planet? Here's your chance. A 1983 SSL 4048 E Series console from Studio 2 in producer Trevor Horn's London-based Sarm Studios is up for grabs on eBay. 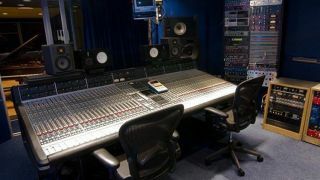 For the past three decades, Studio 2 has been one of the most coveted rooms around with artists such as the Pet Shop Boys, Metallica, Alicia Keys, Blur, The Kaiser Chiefs, Mark Ronson, George Michael, Frankie Goes To Hollywood, Coldplay, Pharrell Williams, Shakira, Rihanna coming through its doors. Along with the SSL desk (with G computer), other gear in the sale includes Sean Davies main monitors w/ Studer amps, Orban EQ, Lexicon 300, Eventide H3000, Sony V77, SPX90, SPX1000, Roland SDE2000, TC2290, Eventide H910, AMS DDL, AMS reverb, BEL flanger, AMS phaser, Eventide flanger, Drawmer DS201, Orban De-esser, Focusrite Red 2, Valley De-esser, Dimension D, Lexicon 224, Lexicon 480, EMT 140 and an Apogee PSX100. The starting price is £49,999.99 (or roughly $78,000 US). To bid on this exquisite gear and for more information, visit eBay.